Hi, I’m Josh Steimle and I’m MWI’s founder and CEO, although I’m not keen on titles. Let’s just say I’m the one who’s ultimately responsible around here, together with my partner and our President, Corey Blake. I started this agency in 1999. It’s the only job I’ve ever held more than 5 months. Here’s the whole story. I grew up around computers. Need proof? 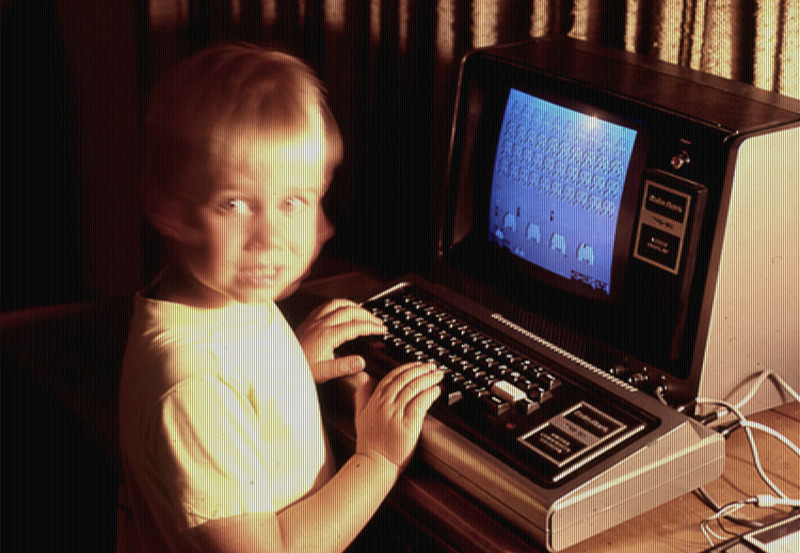 Here I am circa 1980 with the TRS-80 my father bought at RadioShack. My father used to write programs on it, record it to an audio tape, and then play the program back onto the computer. I used it to play video games. I was also driven to art. I used early design programs like Paint to draw pictures on the computer. But my artistic outlets mainly focused on pencil drawing and stipple using a fine-tipped pen. I planned on attending Art Center in Pasadena, California. But something funny happened on the way to Art Center. First, in 1993 I went to college in Rexburg, Idaho named Ricks (now called BYU-Idaho by some). There I took beginning art classes, which I loved. I was more set on being an artist/designer than ever and planned on transferring to Art Center once I finished my first two years at Ricks. But then I served an LDS mission to Manaus, Brazil. While a missionary, I saw a pamphlet for a business program at BYU-Provo. I had started a few “businesses” while a kid and teenager, but until that point I hadn’t realized one could study “business” at college. I thought business was something people just did. I was fascinated, and decided I would keep art as a hobby but make business my career. During 1998 I worked at various tech jobs while going to school, but finally landed a job designing websites. It wasn’t that I wanted to design websites for a living, but it paid decent enough, and the company had some dot-com ambitions, which were all the rage. That company fizzled out quickly, but now I had “web designer” on my resume and that helped me land my next job with a company then named MyComputer.com. I was employee #22 or #24 or thereabouts at MyComputer.com. The company was well funded and was growing at a rapid pace, as all dot-coms were at the time. My boss there was Aaron Walser, a talented creative director and designer, and the best manager I’ve ever had (no offense to the others). I only worked at the company for five months, but I went in more or less clueless, and came out with an education in design that has stuck with me to this day. It was while working at MyComputer.com I first looked at a company and told myself “I could do this.” I was offered 3,000 stock option shares to stay, quit school, and come on full time. I decided to turn the offer down, stay in school, and start my own business instead. MyComputer.com went on to change its name to Omniture, and a few years was bought out by Adobe for $1.8B USD. I still think I made the right decision. Then began the following timeline. It’s hard to explain to someone today how crazy 1999 was. It seemed everyone was buying into the idea that the Internet would change everything. People were raising millions of dollars for ideas scrawled on napkins. People were raising money when they didn’t even have an idea by walking in to a venture capitalist’s office and saying “I don’t know what I’m going to do, but I’ll figure out something awesome.” Everyone wanted “in” on the Internet and nobody wanted to be left behind. I got sucked into that excitement. When MyComputer.com gave me the options of going full time or quitting, it wasn’t too hard of a decision. I already wanted to start my own business, and this gave me the excuse. I went home to my wife and told her I wanted to start a business, and her response was “Well, we’re college students and we have no money, so what have we got to lose?” If she had only known what was coming. I quit at the very end of 1999 and started my own web design company as a sole proprietorship called DonLoper.com. There’s another story there behind that name, but you’ll have to ask me in person for the details. The business consisted of me working on a computer and a DSL line (256K, fools!) in our $500/month studio apartment. Somehow I thought that if I threw up a website and told people I designed websites, I’d be flooded with clients trying to pay me tens of thousands of dollars. Instead, there was the chirping of crickets. No, if you build it they will not magically come. As I struggled to find clients to pay me anything, we lived off of student loans and by selling much of what we owned on eBay, which was still something of a novelty back then. Then I got a lucky break. A sales guy called me on the phone and tried to sell me something. I wasn’t interested, but he was persistent and started trying to get to know me by asking what I did for a living. I told him I was designing websites, and he said “Oh, my brother needs a new website for his business!” He gave me his brother’s name and number, I called him up, and that was my first client. I asked for $15/hr, and I got it. Considering I was getting paid $13/hr at MyComputer.com, I felt like I was doing pretty well. My next client was a former co-worker at MyComputer.com. I decided to push the envelope a bit with him and ask for $18/hr. He bit. I was ecstatic. I was on my way to earning my millions. Then there was another client, and another, and each time I would ask for a bit more. $20/hr, then $25/hr, then $30/hr. I was convinced that no college student had ever made so much per hour as I was making. While my friends were working as janitors earning $6-7/hr, I was making several times that, and in the comfort of my apartment, whenever I felt like working. Then a client contacted me that seemed to have deeper pockets. I knew the web development firms in Utah were charging around $125/hr, and I didn’t see why I should be charging anything less if I was producing the same kind of results. I decided to take a leap and asked for $65/hr. I was turned down flat. They even seemed offended. I had flown too close to the sun, and now I was crashing and burning. What was I thinking asking for $65/hr? This company could have kept me busy for two months at $30/hr and I would have been thrilled with that. But it was too late, the deal was gone, and I went on, trying to find other clients, decidedly stuck at $30/hr. I couldn’t believe it. $65/hr for a college student? Sure, it might sound funny to you now, but this was huge for me at the time. I felt like a millionaire. Over the next two months I made about $6,000 per month working part time, while going to school. Now, what would you do with $12,000 as a college student? Pay off the student loans while still in school? Tuck it away in savings? Well, yes, you might do that, but I was a crazed entrepreneur. All I could think was “Gee, if I can do this well on my own, just think what I could do with employees and an office.” That money was burning a hole in my pocket. But instead of buying a car, or a nice TV, or taking my wife on a vacation, I decided to start a “real” business. I brought on two partners, moved into an office, and hired on some full time staff. A lot of mistakes were made in how we grew early on, but we survived and did some great work over the next few years. By this point we were doing branding, print work, content management systems, ecommerce, and custom web integration projects. We lost our identity trying to do everything for everyone. At one point we had a list of over 20 services on our website. Sure, we’ve got quite a few listed on the website right now, but they’re all tightly related and many are merely subsets of another. That wasn’t the case at this time. We thought we were an ad agency, branding agency, web development firm, and web design firm all wrapped up into one awesome digital agency. In reality we lacked focus and people didn’t know what we were. SEO was still a new thing at this point. We had started doing it for ourselves, and we had a client come along and ask if we could do it for them. Since we were still doing anything anyone would hire us to do at this point, we agreed, and that was a great stroke of luck, since online marketing has become what MWI is all about today. This is also the point at which our business became less about “Need a website? Yeah, we can do that,” and more “Tell us about your business, and we’ll tell you how we can help you grow it in a way that will pay for itself.” Since then we’ve become much more customer-focused, recognizing that the more we can align our objectives with those of our clients, the better things work out for everyone. Except our clients’ competitors. By this point we had decided we were very good at two things; SEO and web design, and we cut everything else. That is, we would still do the other work if it made sense, but we didn’t advertise it. We still don’t advertise that we do systems integration and programming work, even though we do quite a bit of it. Our focus remains on online marketing, and we only take on ancillary services to better meet the needs of our online marketing clients. In 2013 we almost went out of business. I had a partnership that fell through and I had lost focus on MWI. But as they say, it’s darkest just before the dawn. The challenges motivated me to find my partner, Corey Blake, and together we rebooted MWI. I began writing for Forbes and other publications and between 2013 and 2014 Corey and I grew MWI by over 1,000%. Today we have offices around the U.S. as well as in Hong Kong, Singapore, and Shenzhen, China with more on the way. Our team is growing rapidly, and we are working with fantastic clients. We’d love to work with you and grow together.